The new Volvo XC60 Estate is another shining example of Volvo’s renaissance. Their best-ever selling car, it’s as safe as you’d expect a Volvo to be, but it’s also hugely likeable in so many other ways: It’s stylish, comfortable and comes packed with a generous amount of standard kit. Even better, the interior is massively improved on last time. A mid-size Estate, it’s taken the versatility of the bigger XC90 and compacted it all into a smaller, less expensive package. Huge rear lights give it some assertiveness on the road, while the fact that Volvo tends to stick to the same engines across its range means there’s something for everyone. OSV takes a closer look at what it’s all about with our 2018 Volvo XC60 Estate review. All the available engines are sized 2.0-litres, thanks to the brands new vehicle architecture. This is no bad thing because, while they’re not the most performative around, they’ll satisfy business users and families. Each engine is reasonably quick and none of them cost too much to run. However, if an exciting driving experience is what you’re looking for, the XC60 Estate will disappoint. It’s far from sporty, although it huge tyres arm it with lots of grip and the steering offers enough communication. Body lean is a bit of an issue due to the elevated ride height. If you pay extra for the adjustable suspension system you can reduce this problem by selecting dynamic mode. Meanwhile, the R-Design models come with stiffened, lowered suspension as standard, but they hardly inject the car with any more personality. Moreover, R-Design models come with bigger wheels, and this will be problematic over lumps and bumps. If you really must go for an R-Design model (which admittedly looks the part) we recommend that you add the adaptive suspension. In terms of its engines, the 187bhp D4 diesel will probably be enough for most buyers. It has a 0-62 time of 8.4 seconds and feels nice and smooth. The bigger D5 PowerPulse unit develops 232bhp which allows for more punch, and it dusts off 0-62 in just 7.2 seconds. It’s a modern engine that uses compressed air to work the turbo faster. Both diesels are paired up with an 8-speed automatic transmission, and there is no option to add a manual. We like the auto ‘box, however, as it makes smooth changes and is fairly responsive. That said, it can be slow to react to downshifts. There’s not a lot to choose from on the petrol front. In fact, there’s just one, a turbocharged 2.0-litre T5 model that develops 251bhp, which is enough to haul the car from rest to 62mph in 6.8 seconds. It’s super quiet, but while it makes less noise than the diesels it’s not as strong. It’s also not the most engaging of engines. The quickest engine in the range is a T8 plug-in hybrid that combines an electric motor with a petrol engine to develop 403bhp. That’s enough to motor its way from 0-62mph in 5.3 seconds, and if you add the Polestar Package you get an extra 12bhp. The interior quality is so much better than its predecessor. Hand-me-down trim from the XC90 is still present, but the materials are top-notch. Comfort is excellent, too. Ride quality and refinement contribute to this, as do comfortable seats that make longer trips a lot less daunting. And while the XC60 is hardly a sporty car, air suspension means you won’t even notice Britain’s broken roads. 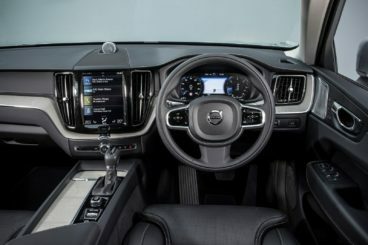 Volvo’s Tesla-inspired Sensus system is all present and correct, and the 9” touchscreen controls pretty much everything. It’s easy to use once you’ve got the hang of it (this might take some time). The ride height is elevated but the driving position is fairly low, and this brings you closer to the dash. That’s not a bad thing because it looks so good and everything is where you’d expect it to be. 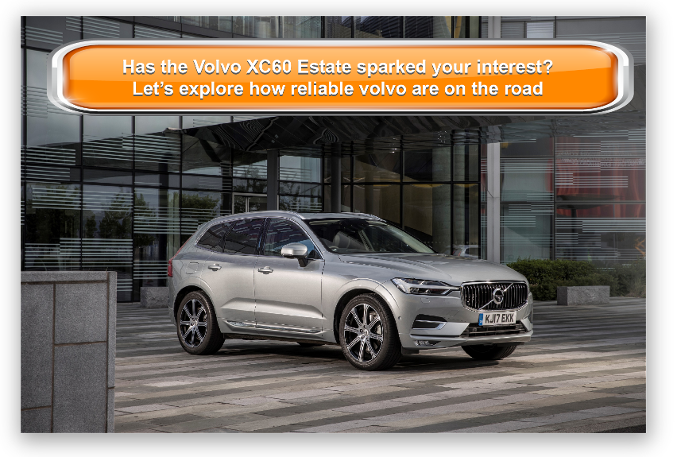 Is the Volvo XC60 Estate practical? Despite being a smaller version of the XC90, it’s absolutely huge inside, which means lots of space for passengers. Five people can relax on longer journeys, and head, leg and shoulder room is just fine. That said, you’ll all feel more comfortable with just four occupants. The boot might be a deal breaker for some. Volvo no longer produces class-leading boots, and the XC60 has sacrificed some of its boot size in favour of style. To the window line, the boot measures 505-litres, and to the roof it measures 635. That’s not bad in isolation but there are rivals who offer much more space. They also offer handles, while the Volvo does not. Standard kit is generous across the range, with the entry-level model getting climate control, cruise control, Bluetooth, a powered tailgate and sat-nav. A Pro upgrade is also available which lets you add the brands On Call concierge service, as well as a heated windscreen and steering wheel. The R-Design trim comes with dual exhaust pipes, 19” alloys, sports pedals, and looks overall more sporty. It gets sports suspension too, which improves the driving experience, while the cabin gets a 12.3” digital display. The Inscription and Inscription Pro models round things off with Nappa leather, ambient lighting, massage seats, and lashings of chrome trim. In terms of how safe it is, there’s nothing to worry about. The Volvo XC60 Estate is as safe as cars come. It was awarded all five stars for its Euro NCAP crash test, while the likes of Steer Assist, Oncoming Lane Mitigation and autonomous emergency braking are included in its standard safety kit. Prices for the new car start out from £36,405 and rise to £49,455. If you prefer to lease, you can pick up a deal from £318 + VAT per month. For more information on our leasing deals, check out our page here. In terms of its running costs, the D4 diesel and the D5 PowerPulse model offer similar economy. The former returns 54.3mpg at best, while the latter returns 51.4mpg. The T5 petrol engine, meanwhile, is good for just 38.7mpg which will probably price it out of many buyers’ budgets. Then there is the T8 plug-in hybrid, which Volvo claim can return as much as 134.5mpg. Bear in mind that this is a wildly optimistic figure, however. All models over £40,000 costs £450 a year to tax, while all models under 40 grand cost £140 a year. Volvo has put the focus on comfort and it’s arguably more comfortable than many of its rivals. Interior quality is also head and shoulders above its rivals. It’s tax efficient and can return well over the 100mpg economy. It doesn’t come cheap, with prices starting out over £35,000. That makes it a lot more expensive than its predecessor. The large doors open nice and wide for easy access. 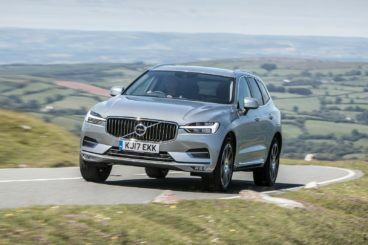 Let’s see how the car fares in the comparison section of our 2018 Volvo XC60 Estate review. 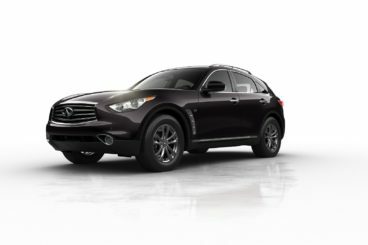 The new Infiniti QX70 is attractive to look at, comes with an attractive price, and boasts a range of powerful engines. There’s not a lot to dislike about the way the car drives, and all variants are jet-heeled. A 3.7-litre V6 petrol engine kicks things off with a 0-62 time of 6.8 seconds, while a bigger 5.0-litre V8 petrol engine covers the same dash in 5.8 seconds. A 3.0-litre V6 diesel engine rounds things off, and is hard to recommend if running costs aren’t a priority of yours. It’s slower than the petrols and a whole lot noisier. A 7-speed auto ‘box is fitted to all models as standard, and while there’s no option of a manual transmission, the fact that you can control the gear shifts yourself using paddles should please some buyers. In terms of how it drives, there’s little doubting that this is a hefty machine. However, it corners well and four-wheel-drive and a four-wheel-steering system are standard on all models. Moreover, body lean is kept to a minimum. Running costs are not fantastic. The cheapest engine to run is the sole diesel, which can return 32.8mpg at best while emitting 225g/km of CO2. The massive 5.0-litre V8 engine returns 20.9mpg and emits 316g/km, while road tax is pegged at £505 per year for both petrols. Inside, there’s a lot to like about the Infiniti, but it’s not the comfiest car in this review. The brand has marketed it as a sporty if luxury model, and that means it mixes a harsh ride with a classy cabin. Still, the cooled and heated seats can be fitted with a massage feature and insulation is generally good. Pick the diesel, though, and you’ll have to put up with a bit of noise. Is the Infiniti QX70 Estate practical? Its boot is on the small size for a car of this type and measures just 410-litres. If you fold the seats, you can at least extend that to 1,305-litres but it still falls short of the Volvo. On the whole, the interior is spacious enough for four people, but while legroom is good, headroom could be better. The new BMW X3 Estate is a smart looking large car that handles excellently for a car of its size. It’s a real driver’s car and the way it handles is one of its biggest strengths. It doesn’t feel anywhere near as heavy as it should, and while the diesel variants aren’t quite as sharp as the petrols, the steering for all models is incredibly precise at speed. In terms of the engines, a 2.0-litre diesel sits at the bottom of the range. It does 0-62 in 8.0 seconds flat and returns an impressive 56.6mpg economy. An 8-speed automatic gearbox is standard and it suits the character of the engine well, with the diesel only getting noisy when you really put your foot down. A bigger 3.0-litre diesel is ideal for anyone who’s not too bothered about running costs, but the petrols are arguably more exciting. That said, the 2.0-litre 20i has still not arrived yet, so your only option at present is an M40i model. It’s a 3.0-litre, turbocharged six pot engine that does 0-62 in 4.8 seconds and comes with twin exhausts. It’s fast and furious but it’s also expensive to run, returning 34.4mpg at best. Still, that compares well with similar models in this sector, but as mentioned the entry-level diesel is much cheaper to run, while the 30d diesel returns 49.6mpg. Inside, the BMW is a very attractive proposition. It’s well equipped, the quality of the materials is excellent and comfort is good. All models come with leather, as well as touches of aluminium and gloss-black. The dash is clutter free, with BMW keeping things nice and simple. 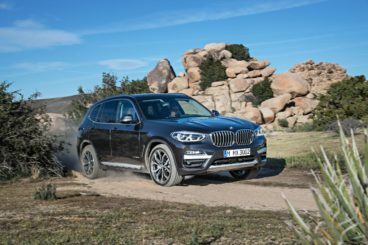 Is the BMW X3 Estate practical? It’s strictly a five-seater but it gets a longer wheelbase than last time around, which means more legroom for all. It’s easy enough for the driver to get comfortable thanks to the reach and height-adjustable steering wheel, while the boot measures 550-litres. Fold the rear seats and it increases to 1,550. No Volvo has sold more than the XC60, which gives you a good idea of how good it is. In 2018, it’s even better than before. It’s comfortable, safe and while it’s not as dynamic as some rivals, it’s got plenty of advanced tech and its high levels of quality can’t be argued with. Expect the Volvo XC60 Estate to keep on selling.